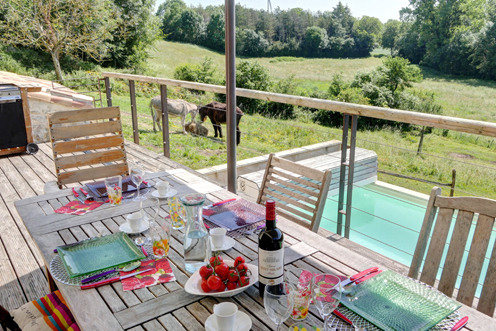 This charming recently renovated Gâtine farmhouse is situated on the edge of the Marais Poitevin, nestled in rich and green countryside. 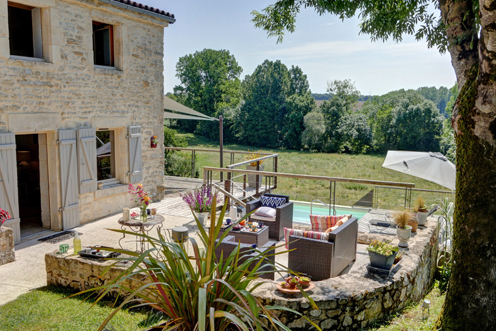 This charming recently renovated Gâtine farmhouse is situated on the edge of the Marais Poitevin, nestled in rich and green countryside. A real haven of peace for relaxation and well-being away from busy towns and the stresses of modern life. 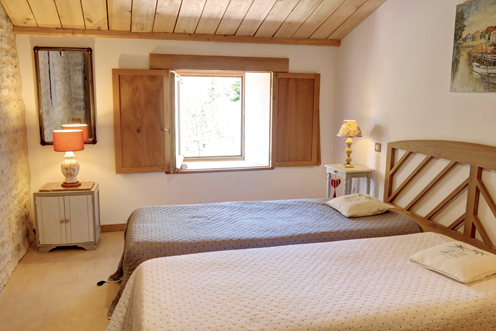 The accommodation offers a living-room with fireplace and a dining room with American style kitchen opening onto a large sun terrace overlooking the valley. There is a family room with bathroom on the ground floor and two more double bedrooms on the first floor as well as another bathroom to suit families and friends. 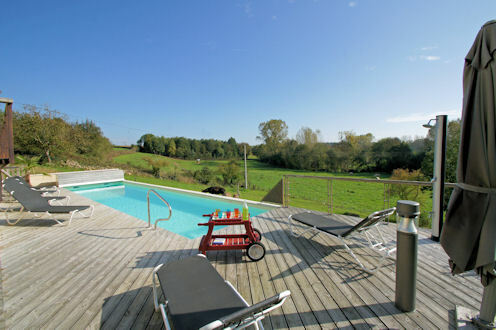 A salt-water treated swimming pool 12m x 3m is heated from April to September and a spa; it has decking equipped with sun beds and a solar-heated shower. There are also 3 adult bikes, 2 electric bikes and a canoe. A massage spa without bromine and chlorine, you provide relaxation and well-being You will plunge into a deliciously soft and caressing water for moments of pure happiness.! A river at the edge of the property offers the possibility of fishing and canoeing. Eco-friendly materials have been used as far as possible in this high quality renovation. TV (satellite reception for UK channels), DVD player, gas hob, oven, refrigerator, dishwasher, washing machine, coffee machine, electric kettle, toaster, vacuum cleaner, iron, hairdryer, baby equipment (cot, highchair…..). Ferry: 4 hours drive from St Malo, 5 hours from Caen, 6 Hours from Cherbourg, 7 hours from Calais. We have had a wonderful week in a lovely house in a perfect location. Blessed by a fantastic weather at the end of the season, we have enjoyed the pool, the spa and the view. 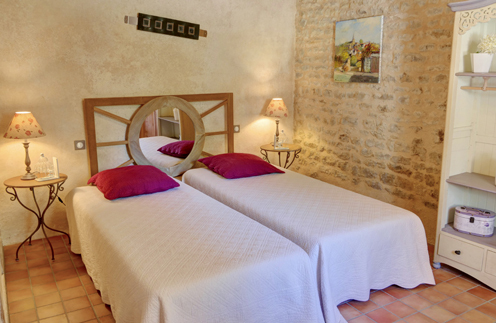 You really have created a Petit Paradis here + we will certainly recommend to others. Philippe, thank you too for your many and helpful recommandations; we have thoroughly enjoyed exploring the local area. We had a fantastic time here at Petit Paradis! The weather was great (someday too hot)- and ever a solar powered pool heating makes that the swimming pool could not cool you all). Christiane and Philippe are wonderful nice persons. They make you feel like welcome from the first minute. Very warm and friendly and helpful. Big applause for you two!! The swimming pool is very nice and we loved the spa also. This is a very nice part of France. Marais Poitevin is an absolute must see (and discover by boat). Thank you very much for you hospitality and having us here. What a blissful week it has been. Despite some heavy rain, we have made the most of the weather on Ile de Ré and enjoyed the wonderful beaches there. Fabulous bread and cheese from the farmer's market on tuesday. The house itself is both beautiful and comfortable, and Philippe is a kind and knowledgeable host. Thank you for a fantastic holiday - we hope to return soon. Our 5th stay here, absolutely perfect as usual. Weather very kind to us. Very hot saturday, sunday and monday. Visited La Rochelle aquarium on wednesday, very good indeed. Hope to return soon. Thank you M + Mme BARRET for a lovely and relaxing holiday. 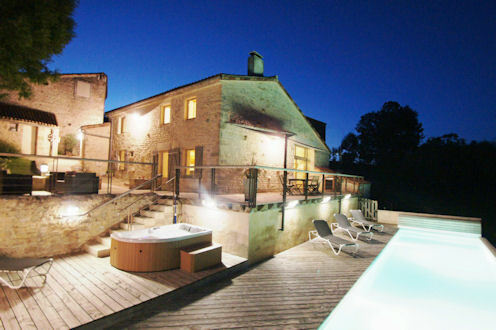 Petit Paradis lived up to our expectations as we thought it would having found it via the Alistair Sawdays site. Philippe and Christiane were perfect hosts. They made us very welcome and provided all sorts of useful information on places to visit etc but were not at all intrusive. Thank you both very much indeed. The level of comfort and decor within the house was good and the salt water pool and spa were great and both very clean. The location is perfect for a relaxing stay with quiet roads and trails for walking and cycling and we expect to return again in the future. Beautiful house and charming hosts. 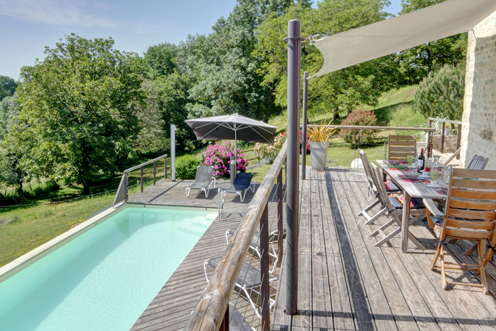 Lovely warm pool and garden with pleasant views over countryside. Interesting area with pretty riverside villages. Very relaxing. Spacious, comfortable, light and airy accommodation . Everything you need including electric bikes to make the holiday complete. We look forward to returning. Petit Paradis couldn't have been better for our holiday with friends and family. 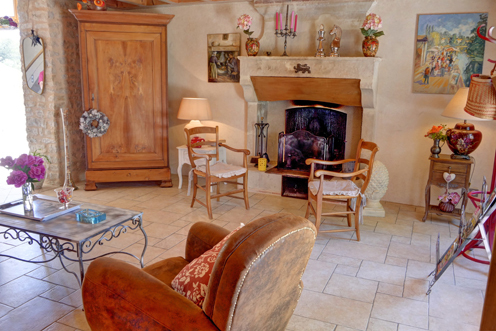 The Gite has been beautifully restored and the facilities provided are second to none. The places we visited from here that I would definitely recommend are: * Ile de Re which seems to be the west coasts version of St Tropez. 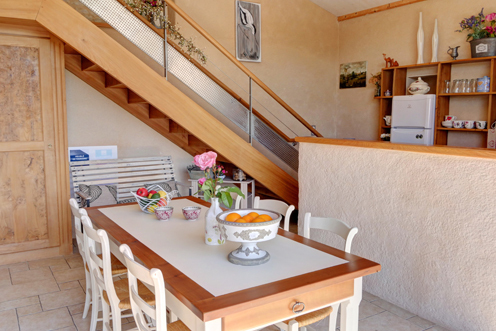 Beautiful beaches, stunning marinas, great restaurants, etc (about 1 hour 15 to get there including the 3km long bridge from La Rochelle to the island) * The Marie Poitevin region. We visited Coulon were we hired a boat to paddle around the canals and waterways. 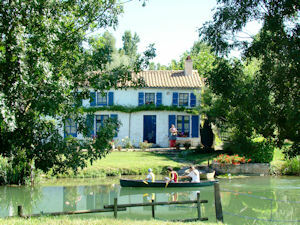 The Marie Poitevin is known as Green Venice with all the little villages nestled amongst the trees and waterways. 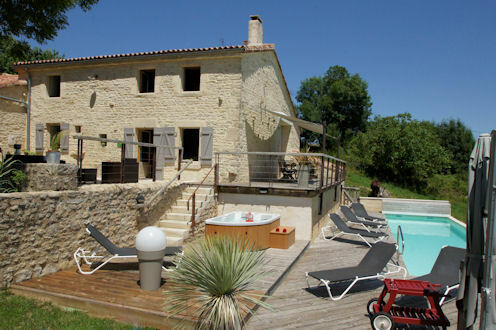 (15 minute drive to get there) There's heaps of other attractions and sites to visit but we wanted to enjoy Petit Paradis playing with the donkeys, fun in the pool, relaxing in the hot tub, walks through the countryside, etc so will definitely be returning to explore further. Christiane and Philippe are the most wonderful hosts who we are looking forward to seeing again soon. Thank you so much again. This 'home away from home' has the wow factor for me. 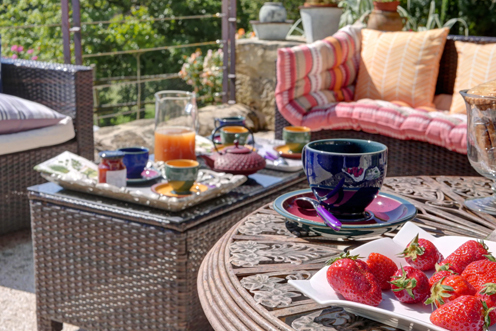 It is beautifully decorated and extremely comfortable with fantastic views. They have thought of everything to allow you to just relax and enjoy your holiday. 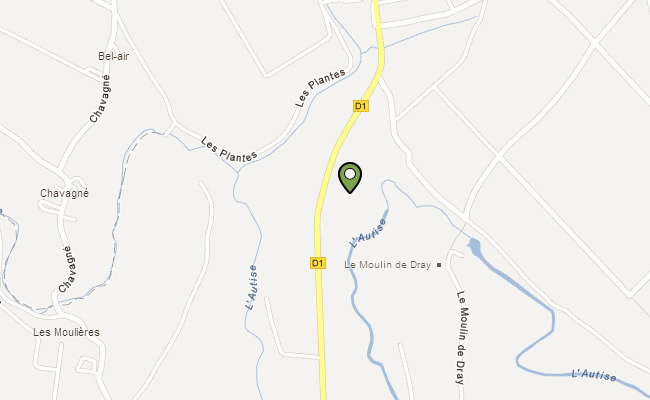 Philippe and Christiane are very welcoming and their knowledge of the area and things to do is amazing. Thank you for having us. 5 of us stayed for 1 week and we were blown away by how beautiful the farmhouse is. It's a beautiful and spacious home with 3 large bedrooms, 2 bathrooms and a massive veranda overlooking the heated swimming pool/jacuzzi and gardens. This place is perfect for any holiday for friends or family staying. Monsieur Philippe is very helpful and knowledgeable of anything you need to know about the house, area and places to visit. I would recommend Petit Paradise and would stay again. We are delighted to be back for our fourth visit since 2010 (also 2012 and 2013). Every time we return the friendly proprietors have added another feature and this year our teenage daughters were very happy that it was a hot tub alongside the beautiful pool. 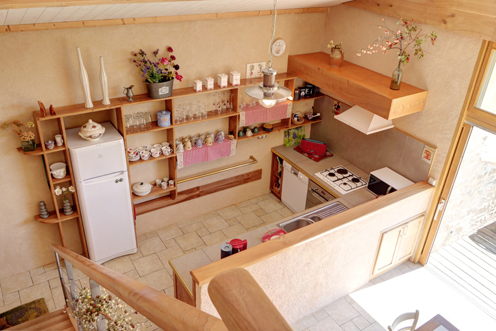 Everything in le petit paradis is finished to a very high standard with lots of space for a relaxing family holiday. Apart from the bikes available to explore the area there is plenty to do locally and Philippe is a mine of information with plenty of interesting suggestions. I'm sure we will visit again. 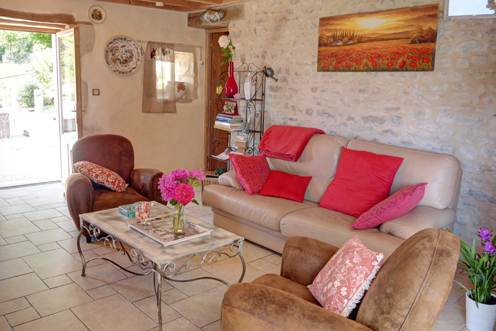 We have stayed in many cottages & gites in France over the years and this is by far the best. It has been lovingly restored and furnished so feels very much like a home. 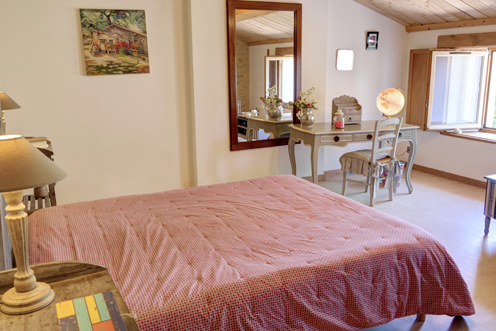 It is located with fabulous views of the countryside with a great balcony, pool area and jacuzzi. 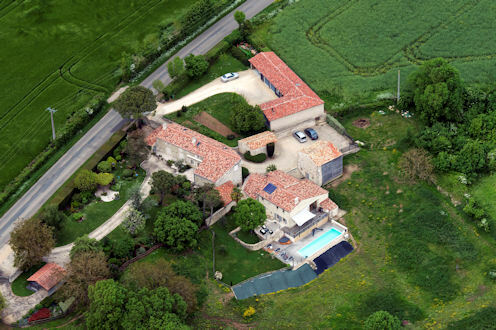 Philippe & Christiane live next door but the organisation of the houses gives complete privacy. Philippe is an excellent host - helpful, considerate but also discreet. We would loved to have had another week here and will definitely come back when we next visit this part of France. As usual, the weather was the only minus! In need of a rest... need to unwind??? -With the first warm days, you can enjoy the sunshine from our comfortable garden furniture or sun-loungers around the pool. -From April – September, the pool will tempt young and old alike to dive into the salt-treated, 26° (min. temp.) water for a few lengths of this 12m x 3m pool. -Let yourself be soothed by the sound of the spa's lapping water which is bromine- and chlorine-free; enjoy air and water massages, and discover chromatherapy which eliminates tension and wipes out stress and fatigue in just a few minutes. Your senses will come alive and you'll discover a foretaste of paradise!!! Leave early, follow the paths...and pedal!!! 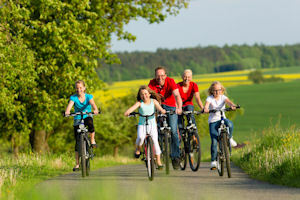 Whether with friends or family, cycling is an excellent way to discover our beautiful region. Thanks to gentle slopes and well-conceived circuits, getting around is child's play. Surprising games, gourmet breaks and nature visits are waiting for you the length of itineraries chosen for their extraordinary natural landscapes. From the Gîte, you can follow the Vallée de l'Autize circuit to discover the heritage of South Gâtine. We provide cycling maps of the Marais Poitevin, Niort, Deux-Sèvres and south Vendée. And so that you can travel light, six adult bikes are available, two of which are electrically-assisted. So, make the cycle paths your own, they are almost always traffic-free. 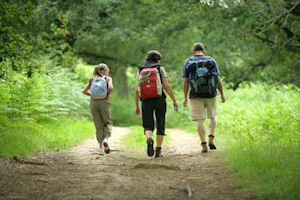 Hiking Trails and walks for all. With family or friends, set-out to discover the signposted walking-trails, adapted to young and old alike, which await you. The only indispensible requirement : a good pair of walking shoes !!! 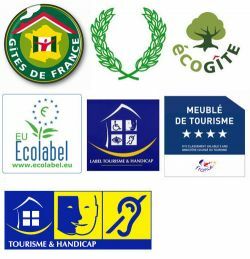 In Gâtine Poitevin, as in the Marais Poitevin or the Vendéen groves, there are numerous walking trails .... and detailed maps and information sheets are at your disposition. One thing's for sure, they provide a preferential environment for walkers and hikers to wear out their shoes !!! Visit the Marais Poitevin Regional Natural Park (15mins from the gite) and discover the 'Green Venise' at Coulon, the dried marshlands criss-crossed with little bridges and pleasant locks or Aiguillon Bay and its splendid nature reserve. Three different landscapes, but a shared sensation of tranquility and serenity... a genuine kingdom for walking, cycling, boat rides and eco-tourism. Shaped by man for over 10 centuries, the Marais landscapes are an invitation to relax and unwind. Here, time stands still ! (Click here for must-sees) only 15 mins from the cottage. Make the most of your stay by visiting our regional vineyards. 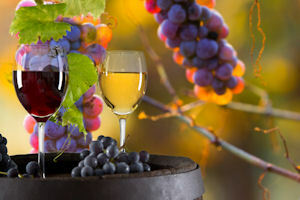 Meet wine producers who will share their passion with you, visit their cellars and taste their range of wines.